OutFront Minnesota has named a new Executive Director. Amy Johnson, with more than 25 years of GLBT community service and advocacy under her belt, will guide the organization forward in this New Year and beyond. Where Do Your Gift Dollars Go? When planning your charitable giving—particularly during these parlous economic times—it is wise to know what percentage of your gift dollars goes where. 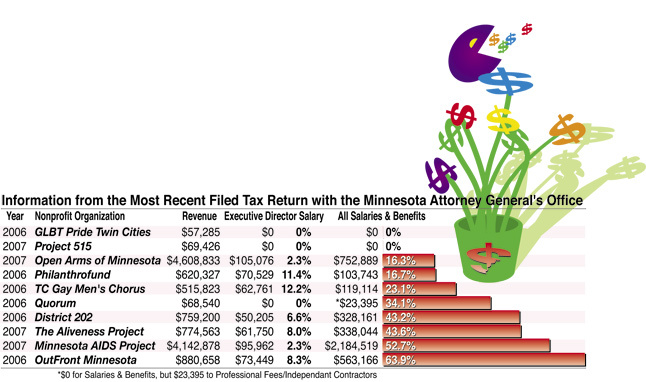 To this end, Lavender examined the tax returns of 10 local nonprofit organizations, on file for public perusal at the Office of the Attorney General, Charitable Organization Division, St. Paul. We plan to do so annually. In the chart below, the final percentages represent the total percentage of salaries plus benefits compared to revenue. When a rock musical wins eight 2007 Tony Awards, including Best Musical, you can’t retreat into excuses about “hating rock musicals” to avoid seeing it.